It was actually cold enough out yesterday that I put on my slippers for the first time this season. A friend of mine has their heat out. He lives in Denver. It was 39 degrees the other day. Sounds like a great time to curl up by the fireplace and read a gaming magazine while under a big, fluffy blanket. 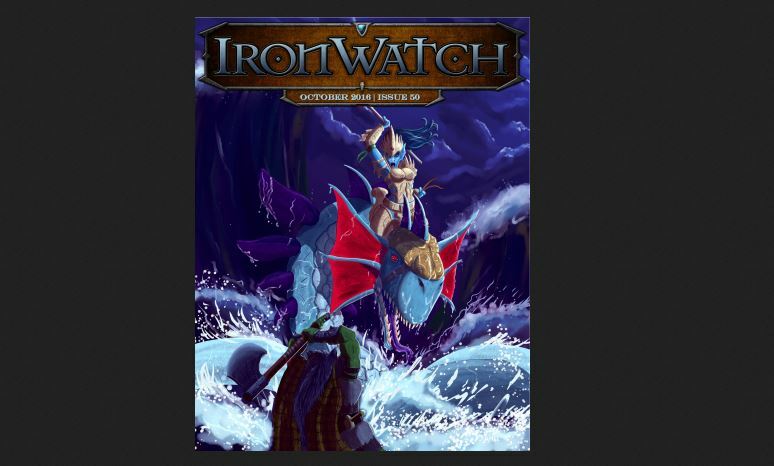 And Ironwatch Issue 50 is now available for your downloading and reading pleasure. What can you expect in this issue? Well, there's Inquisition scenarios for Star-Struck City. You can read about the continuing saga of Rylor Ings and his Enforcers. There's an Order of Maurice story involving a disappearing captain. As usual, there's a variety of painting and terrain tutorial articles. All that and more, all for free, as usual.